Spend an entire month exploring New Zealand on this epic 42 day self drive tour and visit everywhere you've ever wanted to go on the North and South Islands. In the north you will travel from idyllic beaches and bays, to vibrant and cultured cities, to world class wine regions. Cross the Cook Strait to the South Island and continue your New Zealand discovery with spectacular mountain landscapes, diverse coastal scenery, and quirky resort town adventure. You will also visit New Zealand's third largest island, Stewart Island, a haven for nature and wildlife, and a stunning addition to your kiwi adventure. 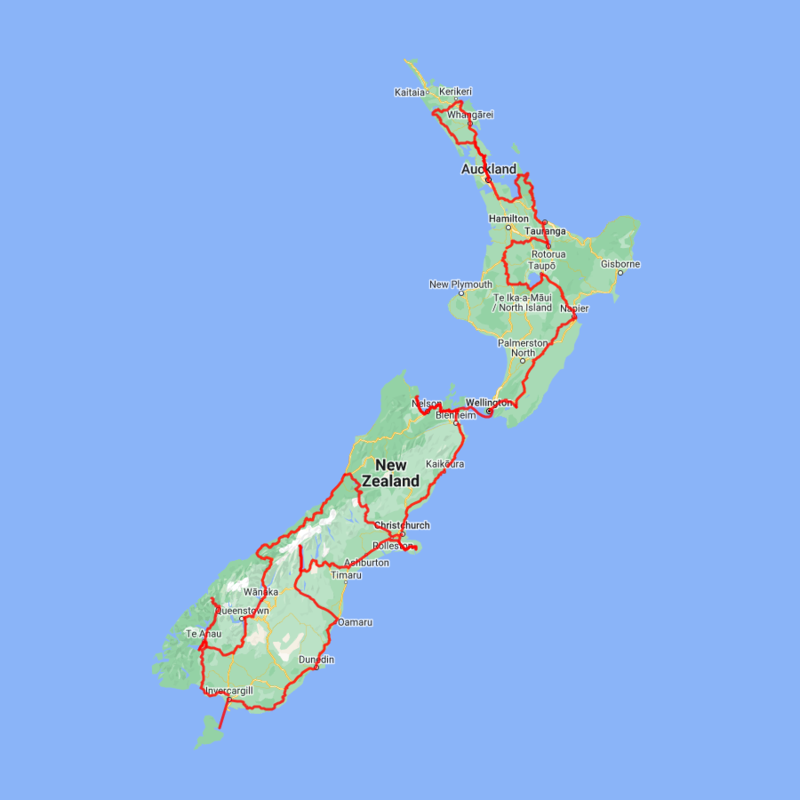 You can expect to spend around NZ$663 in fuel cost on this itinerary based on an intermediate sized car. Heading west from the Bay of Islands you leave the Pacific Ocean and soon and arrive into the Hokianga and the wilder seas of the Tasman. The small townships of Omapere and Opononi have a great seaside feel and the perfect place to stop for an ice cream. The route now heads south and into the Waipoua Forest, home to the massive Kauri trees. Make sure you allow time to take a few short walks that are signposted as you pass through the region. Not to be missed is the 5 minute loop to view the largest of all the trees Tane Mahuta. Heading back across country the Matakohe Kauri Museum is an award winning museum and has extensive displays of the regions logging, farming and social history. Just a short drive from Warkworth towards the coast is the small township of Matakana and a little further you will find the often deserted beaches of the Tawharanui Marine Reserve. Continuing south you pass through Auckland biggest city, Auckland, and soon you will pass the city boundaries where the landscape changes to rolling lush farmland. The fertile Hauraki Plains are one of New Zealand's largest dairy producing regions. The Thames Estuary is a haven for wildlife in particular shore birds and a short detour to Miranda (well sign posted) is worthwhile to see the large flocks of godwits and oyster catchers amongst others. Arriving into the old gold town of Thames you can choose 2 different routes to the Coromandel's east coast. Straight over the Coromandel Ranges on highway 25A will deliver you to the coast in around 45 minutes. The more scenic route however takes you north to Coromandel Township along the Pohutukawa Coast (part of the Pacific Coast Highway). This is one of the most spectacular drives in the region and not to be missed. Waitomo Glow-worm Caves Formed over 30 million years ago there are two levels to the Waitomo Glow-worm Caves which are 16 metres apart. The upper level is dry and includes the entrance to the cave, the Catacombs and the Organ Loft. The lower level consists of stream passages and the Cathedral. As you glide quietly beneath the lights of thousands of glow-worms, it is only the gentle sound of dripping water that reminds you that you are deep underground and not beneath a star filled sky. Aranui Cave Located in Ruakuri Scenic Reserve, Aranui is a dry cave. There is only one entrance to Aranui and without a river flowing through, it houses very little life past the entrance. However, just inside the entrance is a colony of cave wetas. Aranui is famous for its beautiful arrays of stalactites, stalagmites, flowstones and unusual formations. Tongariro National Park is also a World Heritage Site. 3 active volcanoes form the backbone of this spectacular region. Hiking, fishing, climbing, mountain biking, scenic flights or simply taking a drive to the top of the ski field road at Whakapapa are some of the most popular ways to enjoy the region. Descending into the trout fishing capital of New Zealand the township of Turangi sits on the Southern shores of Lake Taupo. Next the township of Taupo and New Zealand's largest lake, Lake Taupo. The lake itself is actually a gigantic volcanic caldera formed during one of the worlds largest ever eruptions. Just north of the town are the Huka Falls and a short detour to view is advised. The Huka Jet can get you much closer with a thrilling jet boat ride also if you wish. Craters of the Moon is a nearby geothermal reserve with well formed walking tracks around its many bubbling pools and steaming vents. The drive takes you through the city of Nelson and along the coast of Tasman Bay towards the Bryant Range. The highway between Nelson and Picton also crosses the Pelorus River and just at this junction is the famous and historic Pelorus Bridge. From here there are a number of forest walks with the most popular the 30 minute loop through beech, rimu and totara forest to the swing-bridge. Starting in the town of Havelock the Queen Charlotte Drive travels the Marlborough Sounds coastline towards the port town of Picton. Magnificent views of the sounds can be had from many vantage points so allow plenty of time to enjoy the scenery. If you can spare the time take the narrow windy road to Portage along Mahau Sound and Kenepuru Sound with their bush clad hillsides and secluded sandy coves. Queen Charlotte Drive delivers you into Picton and its from here that the Interislander ferries arrive and depart. The small town centre has plenty of shops and cafes and the waterfront area is a very pleasant place to spend a few hours watching the activity of the ships. The Edwin Fox Maritime Centre on the wharf is worth a visit with the star attraction being the vessel the Edwin Fox, reputably the 9th oldest ship in the world. Just 30 minutes south is Blenheim siting right at the heart of the New Zealand's largest wine producing region, Marlborough, and is ideally located to enjoy an afternoon sampling of the local produce. The Banks Peninsula offers a great contrast to the South Island's largest city. Just around a 1 1/2 hours drive from the city centre are rolling green hills, streams, golden sand beaches and small settlements that offer a unique insight into New Zealand's history and development. Just on the other side of the Port Hills is Lyttelton, a busy port town that was crucial to the development of Christchurch and the Canterbury Plains. Following the road around the beautiful natural harbour the names, such as Magazine Bay, Battery Point, Corsair Point and Governers Bay, remind of the importance the navy placed on this harbour. The Banks Peninsula itself is actually the remains of a long extinct volcano, the rim of which collapsed some time ago allowing the sea to flood into and create what is now the Akaroa Harbour. In 1840 French colonists settled in Akaroa in a bid to stake a claim for the South Island. Unbeknown the British had already declared sovereignty and a long drawn out dispute ensued with the British eventually being given government. However the French stayed and made this stunning part of the South Pacific their home and still to this day the town boasts French street names and every year a French Festival is held. The Harbour itself is teeming with wildlife and a nature cruise is a must do activity. One of the world's smallest and rarest dolphins, hectors dolphin, are often seen and cruises also offer excursions with the chance to swim amongst them. Learn about the endangered Yellow Eyed Penguin when you visit Penguin Place, a private conservation reserve dedicated to ensuring the survival of this unique species. The project is entirely funded by guided tours which allows the conservation team to engage in habitat restoration, predator control, a research program and on-site rehabilitation care for the sick starving and wounded birds. When you take a tour, you will learn about the issues the Yellow Eyed Penguin faces , their life cycle and how the project is carried out. You'll take a short bus trip over the reserve and be led on foot by your guide through a system of covered trenches to viewing hides which allow access to the living and breeding grounds of this very shy bird without disturbing them. The short drive takes you along the lakeside and across Southern farmland to Te Anau, the gateway to the Fiordland National Park. Te Anau sits on the shores of the 345 square kilometre Lake Te Anau which reaches depths of 417 metres. Te Anau Township is the starting point for many walking tracks including the Milford track and the Kepler track. The Milford road originates here and this is arguably one of the most scenic stretches of highway in New Zealand. During winter the town's population more than triples as snow sports enthusiasts flock to the local ski fields of Treble Cone and Cardrona. Known as the gateway to the Mt Aspiring National Park, Wanaka is a walker's paradise of remote wilderness, high mountains and beautiful river valleys. For those seeking an adrenaline rush try skydiving, rock-climbing, jet boating or choose a scenic flight over Wanaka in a historic Tiger Moth airplane. Lying close to the center of Lake Wanaka is Mou Waho Island Nature Reserve. A unique glacial remnant of the last ice age, the island is also the historic site of early shipbuilding and used to be a stopping place for the steamers and log rafts that once plied the lake. Accessible from Wanaka by a 35 minute boat cruise, the landing is on the eastern side of the island where the remnants of early settlement remain; a stone wharf and a hut. A well-formed track leads from the landing and climbs steadily through native bush to near the top of Tyrwhitt Peak. Just before the top we see Arethusa Pool, a small lake on the island with small islands in it - very intriguing! From the top we have a sweeping 360-degree view of Lake Wanaka, its surrounding mountains and valleys, and below Arethusa Pool. The perfect spot to stop for a tea or coffee. Going back down the track gives us more time to take in our surroundings, listening to and watching the lively bird-life, and just enjoying this unique wildlife reserve. You will feel well rewarded as you re-join the boat for the cruise back to Wanaka. Total cruise time is 1.5 hours. The trip runs subject to weather and lake conditions. Step back in time where to when pilots were larger than life, and heroes to all those who lifted their eyes skyward to the sound of an old tiger moth flying overhead. Take a scenic flight around Wanaka in a Vintage Aircraft and experience the excitement of the early flyers and their flying machines; the smell of oil and aviation fuel, combined with the aroma of fresh leather. As you don the old-style leather flying helmet, complete with flying goggles and silk scarf, experience the anticipation of being taken back in time to the nostalgia of this by-gone era. The exhilaration of the open cockpit and the wind in your face – discover the freedom and romance of a vintage scenic flight from Wanaka, one of the most spectacular scenic locations in New Zealand. This 20 minute scenic flight takes you over the township of Wanaka, including Lake Wanaka, Lake Hawea and surrounding areas. This flight takes in some of the most stunning scenery in the South Island with the backdrop of Mt Aspiring National Park and the Southern Alps. The route follows the shores of Lakes Wanaka and Hawea before you enter the village of Makarora, the gateway to Mt. Aspiring National Park. The Blue Pools, just outside Makarora, are a wonderful 30 minute walk through pristine native beech forest. Descending into Mt. Aspiring National Park and towards the Haast Pass, crashing rivers and waterfalls are around every corner. Crossing the Haast River you are now truly on the wild West Coast, a 600 kilometer stretch of bush, rainforest and podocarp forest. First Fox Glacier welcomes you to the glacier region and Franz Josef township is just a further 45 minutes. A great way to experience the glaciers is with a scenic flight or glacier hike.